Was the last *new* Cover Art really from the holiday season? Boy does time fly. 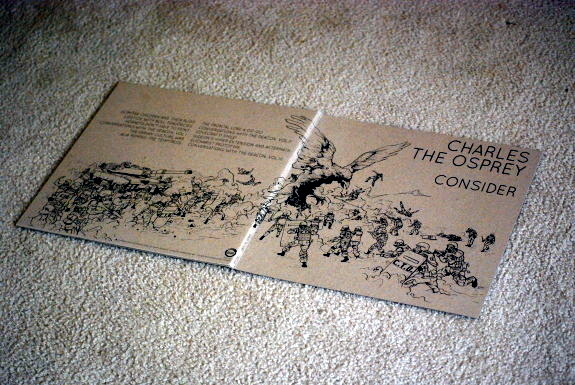 Well, I received this nice slab of vinyl in the mail the other day and I couldn’t help it. The camera came out and that led to this: the first Cover Art piece we’ve done in more than six months. 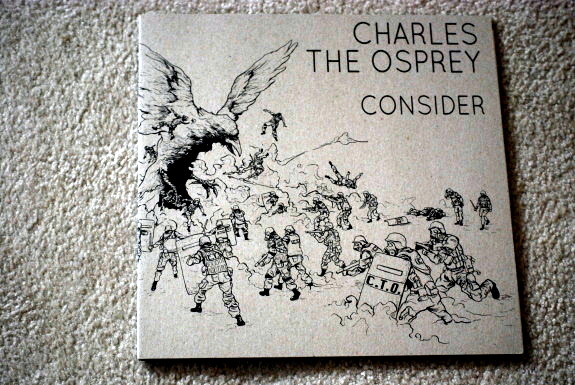 The band is Charles The Osprey and the album is their latest, Consider, out now on Friction Records. 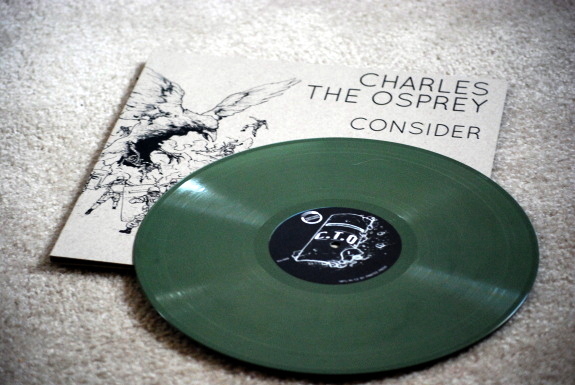 And on green vinyl at that! After a show early into the band’s tenure as kings of instrumental math-rock in their hometown of Grand Rapids, Michigan, they found a note on a bar table written by a woman who “really enjoyed your obvious LACK of musical talent” (her emphasis). “It also really helps to play your bad music really, really loud. Give me a call sometime.” The document was featured on the popular website Passive Aggressive Notes and later in a book published by the site’s creators. However they sounded at the time, they’ve probably come a long way. Consider sounds pretty decent to me, and after a few spins on your turntable I wouldn’t be surprised if you arrive at a similar conclusion. Glad you like the cover art! 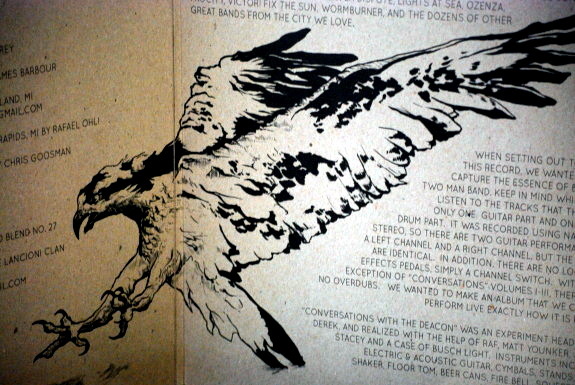 The illustration was done by our friend Ryan G. Hill. His stuff is pretty amazing. That note is also my favorite – it hangs in my office. 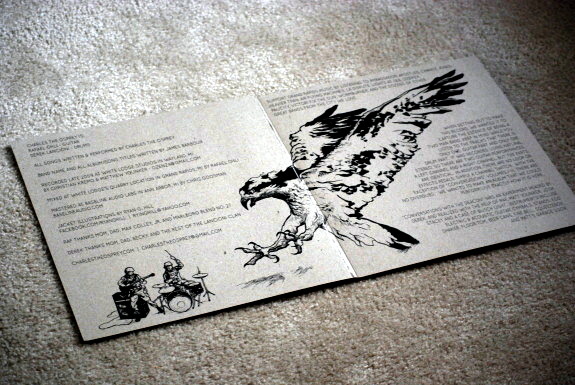 There’s a pic of it on our website if you wanna see it for yourself. Thanks Derek! Loved receiving the record in the mail! Good stuff. Gotta say, I love that she even left her number. SONG IS F****** AWESOME!! Great vibe to it. Great for an early morning coffee and cigarette break!!! Who am I kidding?? I’m always on a break! Anyways great tune guys. Enjoyed it immensely..as I listen to it again! !